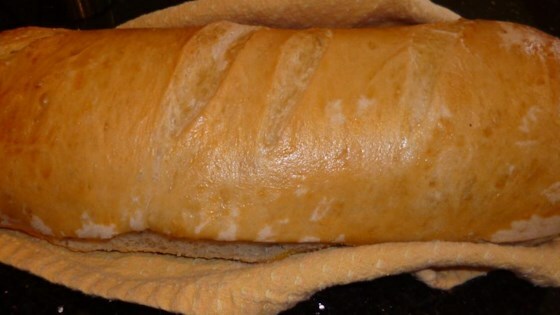 "This French bread recipe has been perfected to my satisfaction - crunchy on the outside, and soft airiness on the inside. I hope you enjoy these stunning loaves!" Place the sourdough starter, water, olive oil, salt, sugar, yeast, and flour in that order into the pan of a bread machine, set the machine on the dough cycle, and start the machine. After the machine has finished its cycle, turn the dough out onto a floured surface, and knead several times; mix in more flour if the dough is very sticky. Cut the dough in half, and roll each piece of dough out into a rectangle about 8 by 12 inches and 1/2-inch thick. Roll the rectangles into loaves the long way, pinch the seams, and taper and pinch the ends of the loaves. Line 2 baking sheets with parchment paper, and sprinkle paper with cornmeal. Place the loaves gently onto the prepared baking sheets, cover loosely with plastic wrap, and let rise in a warm place until doubled, about 30 minutes. Place a large baking stone onto the center rack of oven, and place a baking dish onto a lower rack. Preheat oven to 375 degrees F (190 degrees C). Carefully pour boiling water into the baking dish. Remove plastic wrap from loaves, and slash several 1/2-inch deep cuts into each loaf with a sharp knife. Whisk egg yolk and milk together in a small bowl until thoroughly mixed, and brush the loaves with the egg yolk mixture. Place the loaves into the preheated oven on top of the baking stone, and quickly spray the inside of the oven 4 or 5 times with a water-filled spray bottle. Shut oven door; wait 1 minute, and spray again; repeat twice more, spraying the oven 4 times with water at 1-minute intervals. Bake about 15 minutes, and remove the water-filled baking dish. Continue to bake until the bread is browned and the loaves make a hollow sound when thumped, about 15 more minutes. Remove bread to cool on racks. The crust is crunchy and the center is moist. What’s not to love? The sourdough starter is a large amount, so be sure to make it ahead of time if you don't have enough. The bread machine, baking stone, and spraying of the oven are all optional and serve to make a more perfect loaf of French bread. A baguette must be crispy on the outside and chewy inside. This was not a baguette. I love this bread. Sourdough makes it tangy. For a Starter, just type sour dough starter in the search and it will bring a few up so you can pick the one you would like. This recipe was simple to make. It tastes wonderful! I really liked this! my husband just bought me a bread machine, but I tsill use this when I want to feel like Ive made something all by myself. :) Thank you! !